I Scream! You Scream! We All Scream For Ice Cream! More specifically, my family screams for ice cream sundaes! It's getting hot out there, and on hot days, who doesn't love a tasty ice cream sundae to cool off with? I'm kind of boring in the flavor department, always opting for vanilla, where my family is usually more adventurous in their flavor choices. We usually have to strike up a compromise. They pick the toppings if I get the vanilla. We are huge peanut butter lovers here, and I often use it in baking. When I saw this Peanut Butter Cashew Sundae at Golden Blossom Honey, I know this was a treat where no compromise was going to be needed. It's got everything that my family loves! 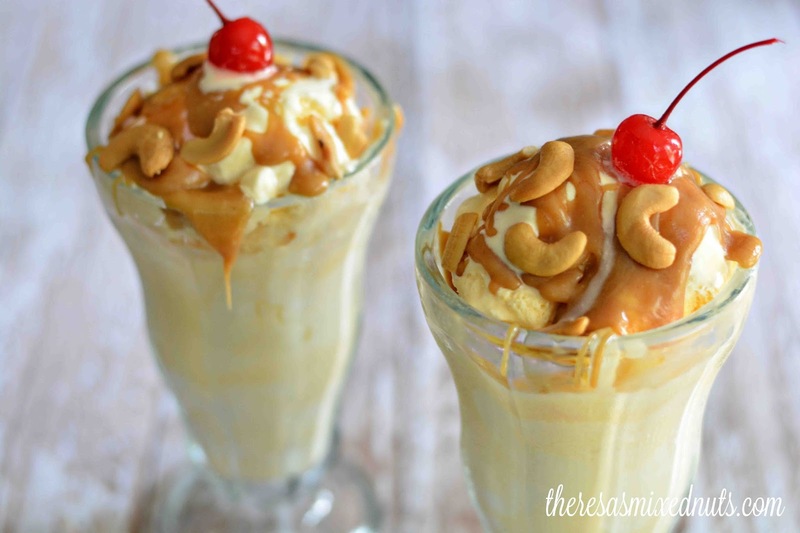 Ice cream, peanut butter, honey and cashews! The perfect combination of sweet and salty all wrapped up in a delicious ice cream treat! I just put the toppings on top of the sundae, but I think layering the cashews and pb/honey mixture in the middle of the ice cream as well would make it even more decadent! What are your favorite Sundae toppings? I've been suffering from a pretty bad sweet tooth lately, so when I saw that picture it looked so delicious that I literally said "Oh !#$& off!" and walked away from the computer for a minute. Okay - I'm trying this, this weekend!! I have heard the cinnamon/honey health benefits before, though I don't know if I would like cinnamon in my ice cream. Topped on apples though, yes! Is Dezzy talking about licking again? He's a crazy one, that Dezzy! Cashews work for me, eat them every day at my sea. Stupid blogroll shows your posts late again, how rude. Yeah, I'm 3 or 4 days late on the blog roll. Stupid blogger! That looks incredible. Cashews are my absolute favorite nut. Yum! This looks amazing. My favorite Sundae toppings are caramel, hot fudge and a cherry. Oh heavens now I want an ice cream sundae--maybe tomorrow. Meanwhile I have to get the ingredients to make this at home-I already have the Golden Blossom Honey and my fav is coffee ice cream--crush up some walnuts--I will be in heaven!! It is 80° out today and I am sweating. I could use A sundae. I could make this recipe with my homemade ice cream I make for myself. That's one thing I've never done, is homemade ice cream. I do have it on my summer bucket list though! Ooh what an awesome after dinner treat these would be. This would be so good, especially with the honey. I so have to make this. Looks tasty. I am a peanut butter addict (seriously its bad) and have dreamed of finding a way to make it into an easy ice cream topping instead of a clumpy mess. This is amazing! The sundae looks absolutely delicious. I cannot wait to make one myself. This looks super tasty. Peanut butter tastes great with cashews. I'm not overly picky with toppings for my sundae. I have never tried one this way though and will have to give it a try soon! This looks so yummy!!! And it has nuts and peanut butter let me have some!!! Those look amazingly delicious and will make a good dessert some night this weekend. I love cashews too. Walnuts get all the ice cream love. I would love to mix it up and try some cashews next time. This looks so yummy! 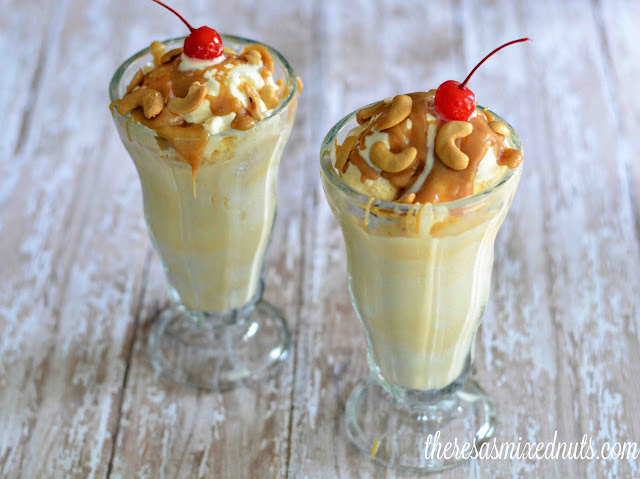 Peanut butter, cashews, and ice cream... oh my! Those look amazing! Oh my goodness gracious. Those parfaits look absolutely amazing. That looks perfect for the summertime! What a treat. YES please!! I could go for one of these right now. My favorite nut is cashew but I have NEVER thought about using them in parfaits though. GENIUS! I love chocolate on my sundae. And a whipped topping. I love the taste of honey, and use it a lot for baking. I have never thought of using it in a topping for ice cream though. Delicious! On a hot day like this, I would love to indulge in one of these sundaes! They look so darn delish! I love ice cream and especially love sundaes! This sounds like an amazing sundae! YUM! I love cashews and you can't go wrong with them mixed in ice cream. The best of both worlds! Wow I never thought to put cashews on my Sundae! Awesome!! That looks so delicious and easy too. A great summer treat.